Tonight I am joined by the author Dr Lesly Devereaux. She will share practical ways that we can break codependence at any point in time, and the sooner the better! 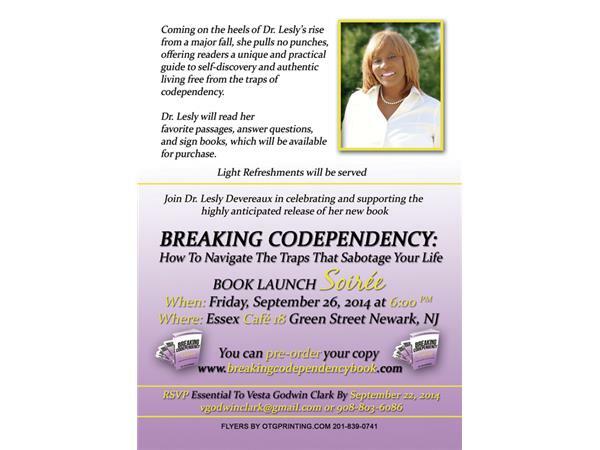 What differentiates Breaking Co-Dependency, (order the book @ http://www.breakingcodependencybook.com) from other books on this topic is that you are brought into the life of the author as she navigates being incarcerated while reflecting on the enabling behaviors that put her there in the first place. Through the narrative of the author, a courageous speaker, coach and ordained minister, we are provided a valuable reference on how to break codependency. Its real value begins with the recommendations of how to stop enabling others. Dr Lesly says....Deal with the demons of enabling; don’t run from them. Running from your problem will only exhaust you. You have heard the expression: you can run but you sure can’t hide. This is true of any situation that you find yourself in which requires you to face ugly truths about yourself. It always seems easier to act like your problem does not exist as opposed to facing it head on. The tendency to avoid internal confrontation is appealing, but it never works. If you want to join the conversation call in on 3479457556 or register with BTR and ask questions or comment in the chat room.